Entertaining at home brings a certain intimacy and comfort to family and friends alike. Instead of an expensive restaurant why not plan a dinner, brunch, or perhaps an afternoon get together with a few friends at home. More and more people appreciate the beauty and provenience of foods, considering wellness in all aspects of their lives which gives you opportunities to try recipes that are both fresh, simple and healthy using produce that is in season and local vendors - it is always smart to have vegetarian and vegan options as well. Entertaining at home can be so much more relaxed and informal. Put your worries behind and start welcoming loved ones into your home. You don't need to be a master chef to be able to put together an elegant and pleasant affair. Too many people for a sitting down dinner, why not cocktails and you can include whatever theme pleases you. The weather is gorgeous and you have a garden, why not a picnic instead of the trivial barbecue. Instead of stopping at a cafe with your girlfriends, why not taking turns having an afternoon tea party at each others places. Growing up it was tradition for first my grandmother and after my mother to have Luncheons. They would include pretty much the same friends, with the addition of a guest here and there and the group would take turns hosting. It was an excellent opportunity to chat, exchange recipes, tips about the kids and professional lives without putting too much pressure on just one person (each one would host around once a year). I know that while visiting other houses, they would be taking mental notes and having ideas planning their own events as well. This sense of community is imperative, even more today when most families live in different parts of the country or sometimes even the world. Be it a birthday party, a promotion, special holiday, seeing friends you haven't seen in a while or to welcome a new season there are always great ideas to be had and a wonderful menu to be put together. Look at your house as if you were visiting it for the first time, you might be surprised that with a few pieces moved here and there, your place too would be ready for a party. Decide on a color palette; white is always very elegant as a base to which you can add several different moods. From a romantic and feminine touch with pale rose peonies and gardenias to a beautiful lunch with perhaps blue hydrangeas or a more traditional dinner with calla lilies to a tropical cocktail party with banana leafs and birds of paradise flowers... the options are endless. 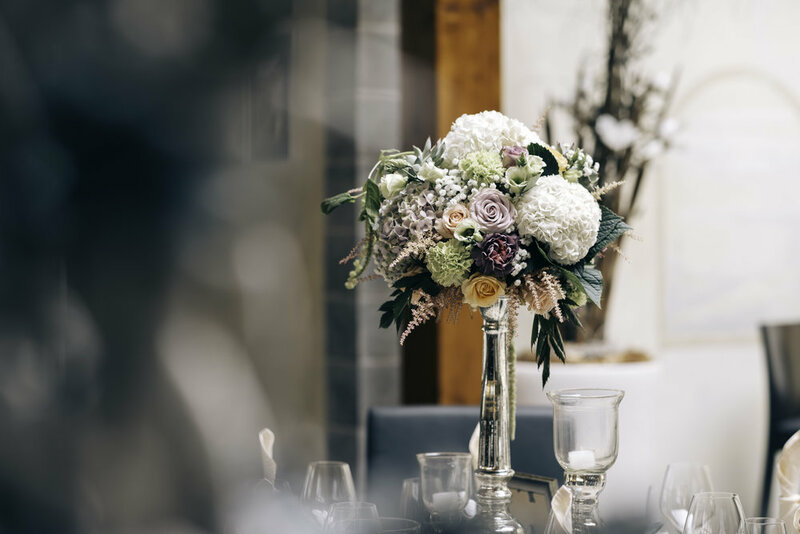 Candles and flowers in addition to a centerpiece arranged in personal ways are enough for most get togethers but, depending on themes, you can always expand from there. Of course, proper manners, nice guests, and a certain decorum are necessary for all situations of life, and I highly welcome them, but it is also vital to be able to make guests comfortable, so they feel that spontaneity and individuality are a plus in your social gatherings. These days it has become so easy to play DJ without having to worry about what song you should play next constantly. A simple subscription to Pandora or Spotify will do the trick, and at my house, I pair those with a Sonos sound system which can control all speakers from an app on my I-phone, easy right? Bach, Spanish guitars, Bossa Nova and some Stan Getz or perhaps Etta James are my usual choices, but I am sure you have your favorites. You can always bring more personality according to the party's theme, why not Peter Tosh for an outdoor summer lunch, or Brigit Bardot for a French cuisine attempt - a little bit of irony and fun will take you a long way. On the other hand, if you have a piano at home it is lovely to hire someone to play for a few hours, a violinist could also be an excellent idea (music schools would be an excellent resource). I try always to strike a balance between etiquette and personality - do know the rules though before you break them. A beautifully pressed white tablecloth is my favorite, although from time to time I browse fabric stores and, having the right measurements, buy fabric to make a one of a kind tablecloth for a particular event (beautiful English florals for a tea party, oversized gingham for a picnic, a gorgeous tone of Dutch linen perhaps for a luncheon would work very well). Make lists and do as much as possible in advance always being realistic about how much time you have so you too can enjoy and host your guests during your event. The more you entertain, the more experience and confidence you will have.